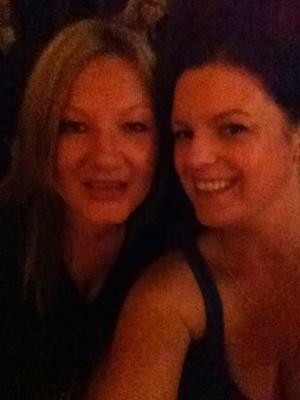 The best lumps in Melbourne to be seen here. Random yet rewarded decision to go to Kamel Tuesday night for dinner with a gorgeous girlfriend. As we arrive, the outside tables are full of people enjoying Melbourne's balmy weather. Seems like several great minds think alike. So far, I am impressed with the inviting atmosphere and I can't get inside quick enough to join in and unwind. Hard day at work? Absolutely - not to mention it was so hot - so who wants to cook? To our pleasure the inside dining room was just as inviting, so whilst the outside was very luring, the heat inducing body sweat made us decide to sit in this time. I love to be in a place that looks good and I thought the layout of the dining room was spot on. Modern and clean decor complemented by the right touch of Arabian trinkets. 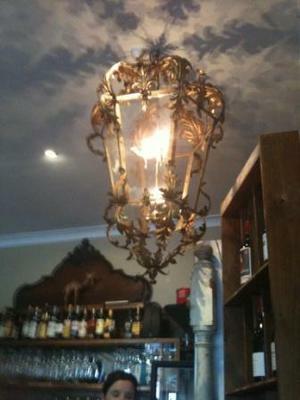 Beautiful feature pieces included elaborate and glam light fittings (see image) and a sculpture of a camel. There was also a gorgeous outdoor courtyard that I could imagine would be (and should be) the place to be for breakfast on the weekend. Private dining rooms are another option for larger groups, so there are plenty of reasons I can think of to return. The ambience was buzzy, yet relaxed and intimate enough to hear yourself think and my girlfriend speak. I think this combination is not the result of a simple rub of the lamp, but is deliberately achieved. Even if it is a fluke, not losing my voice and having my ears ringing, like I've been to a rock concert, is one of my wishes for week night dining. Now that Kamel has the ambience sorted, I can concentrate on asking for the three true wishes for any night dining, one - great service, two - great food and three - great wine. Let's see if it's granted? Everything on the menu looked divine; a mix of Middle Eastern and North African delights designed for mezze style dining. The lovely waitress gets a cave full of gold for explaining there is also the option to have half serves of many dishes. We were so pleased this was pointed out, as we had become so engrossed in our chatting, that we had skipped over this detail on the menu. The wine list was very good and there were several lovely Australian choices that I am sure would have been delightful, such as Yerring Station Shiraz Voigner, Heathcote Tar and Roses Tempranillo and the Victorian Alps Gapsted Dolcetto Syrah, served chilled - which is my current favourite. But I got drawn to the special, a Spanish 2008 Viejo Crianza Rioja (Tempranillo) and could not have been happier with this selection. 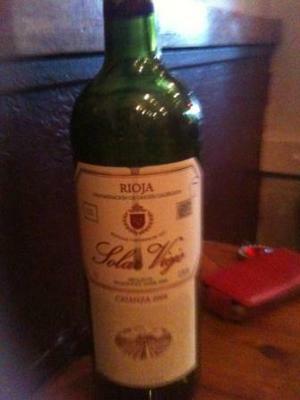 My girlfriend, who has impeccable taste, could not help but blurt out that the wine decision was "Wow! So good!" Admittedly, this response never fails to put an extra skip in my step and smile on my dial when this happens. This Spanish delight was light to medium, so enough body to be exploding with flavour yet super smooth for light and easy drinking. Enough said. My girlfriend had the foresight to book in advance and I am glad she did, as for a Tuesday night in suburbia (albeit inner city suburbia) this place filled up. And I'm not surprised as the impressive menu and atmosphere would appeal to everyone from Arabian royalty to sultry 'I Dream of Jeannie' taking her master here to attract him to all things Middle Eastern. 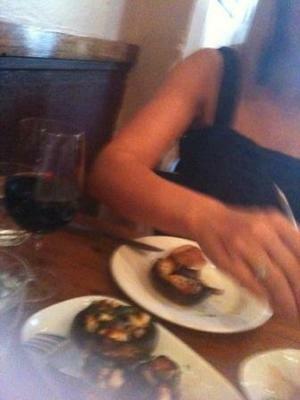 All our food choices were fresh, tasty, indulgent and the service was attentive and helpful. Particular highlights were the field mushrooms with feta and herb oil. Each bite felt healthy, wealthy and wise and this dish will be a compulsory request for each visit to Kamel. The other favourite which had all the characteristics of a signature dish, was the Middle Eastern plate. This was a generous serve of Lebanese sausages, dolmades and marinated kalamata olives with salad, feta and bread. It was a regal like dish and all meat eating masters and boys (who wish they were masters) will be pleased with this one. As for moi, I can confirm with pleasure that all three wishes for my Tuesday night dining had been wistfully granted; great service, great food and great wine. The downside? We had no room left for dessert. A true tragedy as when glancing at the offerings much to my Turkish delight - there was a long list of sweet sensations. Immediately the chocolate and rose water mouse with crushed pistachios and rose cream grabbed my eye. Then, the vanilla and orange blossom custard bird's nest that sounded as pretty as an Arabian princess caught the other eye. And not to disappoint the traditionalists, there are plenty of favourites like Turkish delight and baklava. On my next visit, I will honour the responsibility of making sure these desserts are as good as they sound. 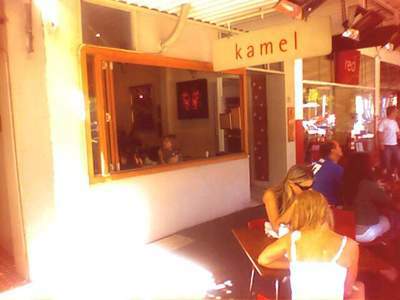 Kamel is no mirage; it is a delicious Middle Eastern and North African mezze style dining experience in peaceful suburbia. Perfect for: Friends eating out, dates, first date, girlfriends, husband and wife, families, trendoittes, try hards, middle aged crisis, grazers, people watchers, birthday celebrations, lastminute.com decisions and Middle Eastern royalty. Do I recommend a visit? Yes. Does the wine list measure up? Yes, and look for the specials in-house to enjoy the overseas beauties. Will I be back? Do camels have lumps? Thanks for reminding me about Kamel. I haven't been for years and have always enjoyed their delicious tapas. 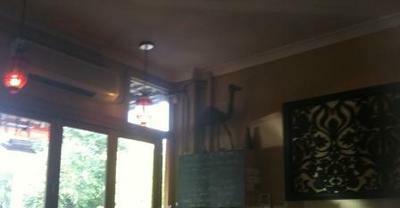 The atmosphere is very cosy and relaxing. They do pretty good breakfasts too.